This may be the first time that J&M are this honest. Hysterical. Jesus, are those boomerangs up your sleeves or are you just pleased to see me? Lets see, who does this remind me of….? Oh yeah, there is an entire list. I bet you’ve been itching to use “jejune” for years. Not to mention that old chestnut, the Kuhnian Paradigm. Aaah, Structure of Scientific Revolutions, philosophy book for scientists of champions! 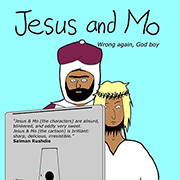 Maybe Jesus and Mo would be better putting their eggs into Karl Popper’s basket? So the common ancestor of homo sapiens and chimpanzees is what, now? ..oh yeah, just another mythical creature.. I didn’t like the new graphics when you introduced them, but I like ’em now. I was wrong… Bof! @CR. We don’t have a solid line of fossils conecting our lineage with that of Chimpanzees. Part of the issue is a political one- when you find a homind fossil in Africa then there is tremendous pressure to identify it as a human, rather than some other primate ancestor. Debates can get quite heated. We know the ancestor is there from molecular genetic work- but will we find a fossil? We hope to find the recent common ancestor, all the evidence points to its being there but who knows? Science is a work in progress always subject to revision. 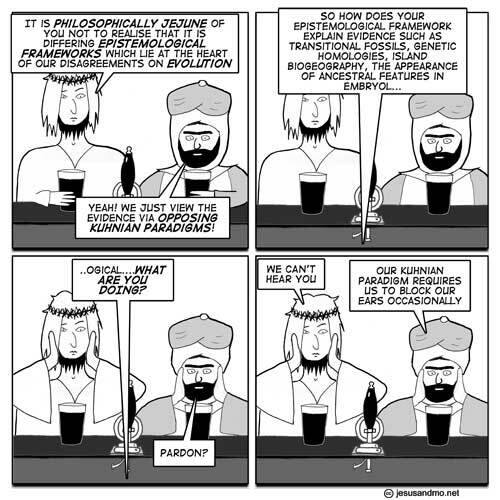 What we do have is a history of our phylogenetic development- plenty to discard the religious view (even if there weren’t other, solid grounds- i.e. that it is just silly). As Dawkins is fond of saying – the fossils are just a bonus, we have abundant proof of evolution without a single fossil ever being found. I’m going to have to print this out and keep in my wallet to show every time someone does that. I think CrusaderRabbit meant “Last Common Ancestor”, which would be one species, rather than “Common Ancestor” which would encompass a very large number of species stretching back over 2.5 billion years (read Dawkin’s “Ancestors’ Tale”). And in answer: The LCA of chimps and humans has not (and probably will never be) identified. This is because it is (currently) impossible to determine descent from fossils, only a comparitive level of relationship. Daoloth is correct in indicating it is known there was a LCA through genetic evidence. This one is for Mark Vernon, isn’t it. 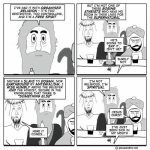 Dawkins also claims Adam & Eve ‘never existed’; a silly thing thing to say; I know 3 Adams and 1 Eve, but lets say he meant there was no 1st man, or that his name wasn’t Adam. All thoroughbreds relate back to 3 Arab stallions that were mated with English mares ~400 years ago. I have no reason to doubt the Stud Book record, or the Biblical genealogy of Adam to Abraham to Joseph. Note that Dawkins doesn’t question the existence of the talking snake. There will never be a LCA, or for that matter an argument settling ‘transitional’ fossil, for the simple reason that evolutionary change doesn’t involve leaps from one biotype to another. It’s like having two clocks, one set to 3PM, and one set to 3.15PM. If you were to try to gather individual clocks that chart the movement of the hands over those 15 minutes, you could never do it. You might gather 900, and show every second that passed, but what about the milliseconds, the microseconds, the nanoseconds, etc. Change is infinitesimally discreet, and what defines a species is artificial (decided by us) and somewhat arbitary. That’s the argument the IDists will use: you haven’t shown us the transitional fossil between species A and species B. Odd. Lack of any evidence whatsoever is typically grounds for reasonable doubt. If I’m ever falsely accused of a crime and am on trial, I sure hope I don’t have any Christians on the jury. @CR. Hmm. You are a troll, and I claim my £5. Enough silliness. @Ophelia. Not intentionally. It was a coincidence. Or worse.. Cherie Booth behind the bench! There are no coincidences, author. @mateogg: on the contrary; my theory is, because he’s an Animist, Dawkins cannot bring himself to deny the existence of any mythical creature. I don’t understand these red herrings being thrown out by the resident troll. Let’s say for argument’s sake that humans and chimps did not have a common ancestor. All that would mean is that we would have to go back to the drawing board to retrace our ancestry in another, scientifically supported, way. @fenchurch: While I know this doesn’t deny your point at all, the evidence demonstrates all life on Earth shares common ancestry. Dogs, frogs and humans share a common ancestor, for example. To “retrace our ancestry” would mean finding a new point where we separated from modern chimps.